The March2Justice, with actor Jussie Smollett in the front row (third from left), moves up Constitution Avenue. It was a march for the people when Justice League NYC's March2Justice arrived in Washington, D.C., Tuesday, attracting activists, everyday citizens and even an actor from the hit Fox TV series Empire. Hundreds had set out from New York City to call for justice for those affected by police violence. "I feel like it's my duty to step up and let people know they matter. Although we are here nonviolently, we're not here peacefully. There is no peace until there's justice, and there's no justice right now," said Jussie Smollett, who plays Jamal Lyon on Empire. Smollett spoke to The Root Tuesday as he joined the protest on the West Front Lawn of the U.S. Capitol. He was there along with a group of more than 400 activists taking part in the march. "It was unbelievable. It was overwhelming at times, when we would get smoke blown in our face and yelled at," said Anthony Plummer, 32, who marched from Princeton, N.J., to Washington, D.C. "That's why I'm out here marching with the Justice League. A lot of my African-American brothers, younger and older—there is really no age difference regarding who is being targeted by our police officers." The March2Justice is the second major march Justice League NYC has conducted in five months. On Dec. 13 it organized a march of more than 25,000 up Fifth Avenue in Manhattan. It was one of the largest police-brutality marches the Black Lives Matter movement has ignited since the fatal police shooting of Michael Brown, 18, on Aug. 9, 2014, in Ferguson, Mo. On Tuesday in Washington, the march staged a "die-in" in front of the Supreme Court Building before gathering on the West Front Lawn. But it isn't just about marching. Members of Justice League NYC will have a "Hill Day" on Wednesday, when they will meet with members of Congress and focus on three specific pieces of federal legislation that confront the issue of police brutality: the Juvenile Justice and Delinquency Prevention Act, the End Racial Profiling Act and the Stop Militarizing Law Enforcement Act. Members of Justice League NYC will meet with the lead sponsors of the legislation, Reps. John Conyers (D-Mich.) and Hank Johnson (D-Ga.), and join them at a press conference at the Capitol. 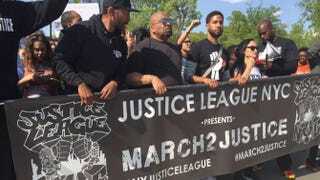 Justice League NYC's 250-mile March2Justice was planned and led by Tamika Mallory and Linda Sarsour. "We will be going before Congress to present what we call the justice package," Mallory told reporters outside the Capitol. "That package includes three pieces of federal legislation that we'd like to see Congress act on immediately. We believe that legislation would help with some of the issues that are happening in the country today around criminal justice." Mallory added that the March2Justice was planned after Staten Island, N.Y., District Attorney Daniel Donovan failed to indict New York City Police Officer Daniel Pantaleo in the choking death of Eric Garner, 43. Donovan is now running for Congress. The Justice League march occurs as national news stories focusing on African Americans killed in police custody, many of those deaths recorded on video, seem to be never-ending. The marchers departed New York on April 13, nice days after Walter Scott, 50, of North Charleston, S.C., was shot dead while running away from now-former Police Officer Michael Slager. On April 12, a day before the march began, Freddie Gray, 25, was arrested in Baltimore for reasons that remain unclear. Gray died a week later, on April 19, as Justice League's march moved through Baltimore. As marchers arrived in Washington on April 20, news hit that Chicago Judge Dennis Porter, in an unusual procedural move, had cleared Officer Dante Servin in the shooting death of Rekia Boyd. On Tuesday the Department of Justice announced an investigation into Gray's death. Activist Jasiri X had this to say from the West Front Lawn on DOJ inaction as that news broke: "You didn't indict George Zimmerman and put any federal charges on them. And this is with a black man as president and a black man as attorney general. I don't really expect anything from the Justice Department investigation. You gave us the Ferguson report but didn't make any changes to that situation. "That's why we've come here today. It needs to be a people's movement. It needs to be a movement from the grass roots on up. That's where we have to really put the pressure on them to bend to the will of the people," the rapper activist concluded.